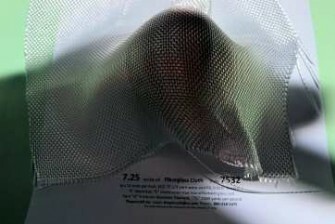 Style 7532 is a nice soft tooling type cloth good for large scale model parts or mold making. 7532 uses the G75 1/3 yarn which means there are 3 of the 7500 yards per pound yarn twisted together in both the warp and fill. All this twist gives it a lot of conformability. This is kind of contradictory in a way when you look at the 3733 that has the flatter yarn, and though a tad lighter, is very conformable as well. I personally havent found the 7533 that is the twist version of the 3733 to be much more pliable for those two. 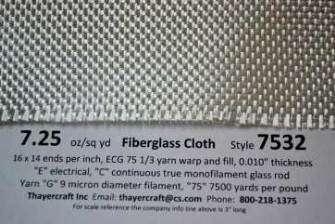 But for the 7.25 oz the 7532 is much more flexible than the flat version of it which is 2532. 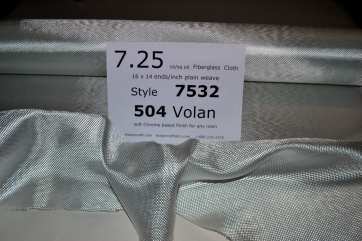 7532 with the Volan finish is the combination pick for the 7.25 oz cloth. All cloth is rolled on 2" pvc and carefully packed in plastic and corrugated wrap. Most rolls ship the same day.